What does the normal status of an electrical switch refer to? Specifically, what is the difference between a normally-open switch and a normally-closed switch? The "normal" status of a switch refers to the open or closed status of the contacts when there is no actuating force applied to the switch. An important qualification for an electrical switch to be either "normally-open" or "normally-closed" is that it have a spring to return it to its "normal" state in the absence of an actuating force. Latching switches such as most toggle switches really cannot be defined in terms of "normally-" anything. Discuss this with your students, possibly showing them some examples of momentary contact switches that are either N.O. or N.C. 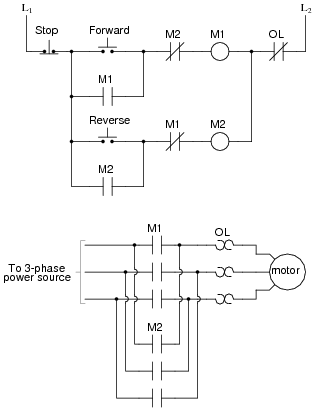 In this circuit, the motor delays start-up until three seconds after the switch is thrown to the "Run" position, but will stop immediately when the switch is returned to the "Stop" position. 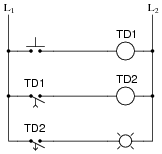 The relay contact is referred to as normally-open, timed-closed, or NOTC. It is alternatively referred to as a normally-open, on-delay contact. 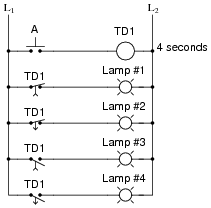 Explain how the arrow symbol indicates the nature of this contact's delay, that delay occurs during closure but not during opening. Note that the ärrow" is pointing in the up direction, toward the direction of contact closure. The arrow symbol is not difficult to figure out, but it is essential to know when working with time-delay relay circuits. Ask your students to describe their understanding of the arrow symbol as they answer this question. Follow-up question: how do you make sense of the arrow in each contact symbol, with regard to whether the contact is timed-open or timed-closed? Ask your students to present their personal explanations of how to make sense of the arrow directions, in relation to whether the relay is "timed-open" or "timed-closed." The correlation is really not that complex, but it is a good thing to clearly elaborate on it for the benefit of the whole class. You may want to re-phrase the question like this: "Does the arrow represent the direction of timed motion or the direction of instantaneous motion?" Follow-up question: how do you make sense of the arrow in each contact symbol, with regard to whether the contact is an ön-delay" or an öff-delay"? Ask your students to present their personal explanations of how to make sense of the arrow directions, in relation to whether the relay is an ön-delay" or an öff-delay." The correlation is really not that complex, but it is a good thing to clearly elaborate on it for the benefit of the whole class. You may want to re-phrase the question like this: Ïs it possible to determine whether each contact is on- or off-delay merely by looking at the arrow, or must one also consider the "normal" status?" Time-delay relays are not the easiest for some students to understand. The purpose of this question is to introduce students to the four basic types of time-delay relay contacts and their respective behaviors. Discuss with your students how the contact symbols make sense (arrows on the switch actuators describing direction of delay). Note to your students how it is possible to have different types of time-delay contacts actuated by the same relay coil. Explain how this circuit works, and also determine what type of time-delay relay function is provided by it (NOTO, NOTC, NCTO, or NCTC). Follow-up question: what purpose does the diode serve in this circuit? For substantial time delays (many seconds) on large relays (high-current coils), the capacitor must be huge, making this a somewhat impractical circuit for all but miniature relays. Study this ladder logic diagram, then explain how the system works. This is an exercise for you and your classmates to analyze! 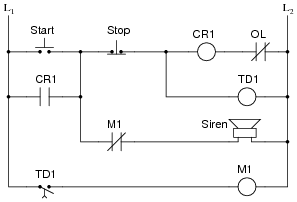 This circuit provides students an opportunity to analyze the workings of a delayed-start motor control circuit, where some other action (a siren in this case) takes place during the motor's delay. Have your students present both their analyses and the methods behind the analyses as you work through this question with them. Analyze this ladder logic diagram, and explain how it starts up the electric motor more gently than an äcross-the-line" starter would. In this system, resistors limit the motor's line current during the initial start-up period, and then are bypassed after the time delay relay times out. After being accustomed to seeing resistors drawn as zig-zag symbols, it may take some students a few moments to realize the ßquare wave" components in the motor power diagram are actually resistors. Confusing? Yes, but this is the standard symbolism for ladder-logic diagrams! Study this diagram, then explain how motor reversal is accomplished. Also, identify the function of each "M" contact in the control circuit, especially those normally-closed contacts in series with the motor starter coils. 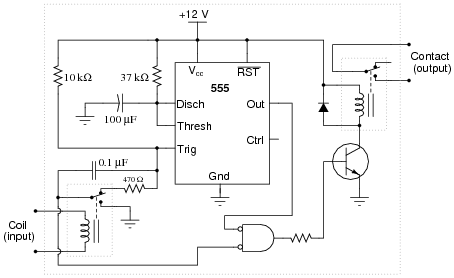 What extra functionality do the time-delay relays contribute to this motor control circuit? The normally-open and normally-closed "M" contacts provide seal-in and interlock functions, respectively. 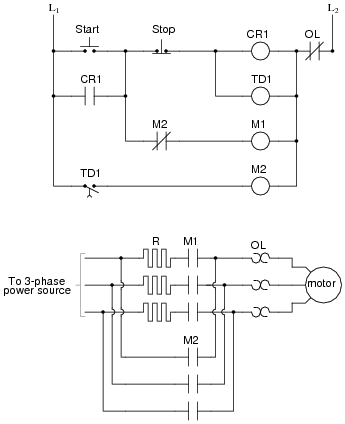 The time-delay relays prevent the motor from being immediately reversed. 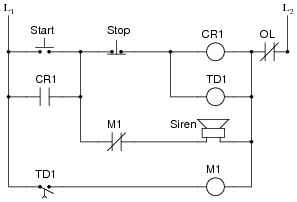 Follow-up question: figure out how to simplify the time-delay relay circuit. Hint: integrate the time-delay and interlocking functions into a single contact (per rung). This circuit provides students an opportunity to analyze the workings of a delayed-start, reversing motor control circuit. Have your students present both their analyses and the methods behind the analyses as you work through this question with them. Unfortunately, there is a problem somewhere in this circuit. Instead of activating the siren before starting the motor, there is silence. The motor's start is still delayed by the correct amount of time, but the siren never makes a sound. Identify some possible causes of this problem. Also, identify portions of the circuit you know to be functioning properly. Note that the following lists are not comprehensive. However, this circuit is poorly designed. Although it works just fine under normal conditions, it may not do what it should in the event of an overload heater trip (if the normally-closed ÖL" contact opens). Explain what is wrong with this circuit. I'll give you a hint: suppose someone pushes and holds the start button long enough that time delay relay TD1 completes its timing cycle? 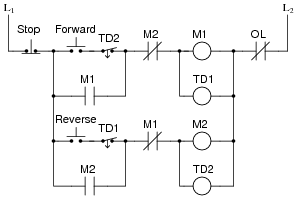 Draw a ladder logic diagram for a circuit that would fulfill this function, using at least one time-delay relay. This is a good problem-solving exercise, figuring out how to creatively combine time-delay relays to perform a specific function. The technician, being well educated in the ways of time-delay relays, takes one look at this timing diagram and begins to laugh. Explain why this diagram is funny. Time-delay relays can do a lot of neat things, but they cannot predict the future! The real purpose of this question is to get students to recognize an impossibility in timing diagrams. As an instructor, I see students mistakes such as this once in a while. Those students who have trouble answering this question may not yet fully understand how to interpret timing diagrams! Also, calculate the amount of delay, in seconds. Hint: the 555's timing capacitor will charge from 0 volts to [2/3] supply voltage during the charging cycle. 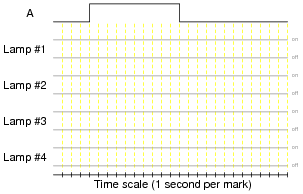 This is a normally-open, timed-closed (also known as a normally-open, on-delay) relay, with a time delay of 4.065 seconds. Some students may mistakenly base their time calculations on the 10 kW resistor and/or the 0.1 mF capacitor. Discuss the role of these two components in triggering the 555 timer, and how the time delay of the relay is actually set by the other R and C.
Explain what a time-delay relay is, and how it functionally differs from a regular electromechanical relay. 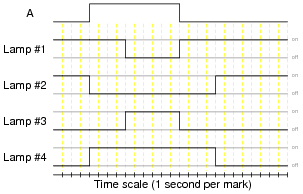 A "time-delay" relay either waits before actuating after power-up, or waits before de-actuating after power-down. The earliest time-delay relays used pneumatic "dash-pot" motion dampers to provide the necessary actuation or de-actuation delays. Modern time-delay relays use electronic timer circuits to do the time delay function, even when the output of the relay is still a set of mechanical contacts. Follow-up question: which relay controls the on-delay time, and which relay controls the off-delay time? Two components or wires in the circuit that you know must be in good working condition. Two components or wires in the circuit that could possibly be bad (and thus cause the off-delay action to fail). Obviously the horn, relay, switch, and battery are all working normally. The capacitor could be bad (failed open), as well as the wiring/connections between the capacitor and the coil. The purpose of this troubleshooting question is to get students to think in terms of fault elimination: deciding what things cannot be bad in order to better isolate what might be bad.